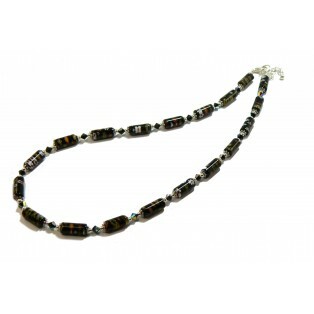 I have made this necklace with black Flower Millefiori Tubes measuring 14 x 6mm each. I have complimented it with Black AB coated Swarovski Crystals to make it sparkle. It looks stunning against all skin tones as the colour is very sharp and vibrant. The necklace measures 45cm (17.75") long and I have added an extension chain of a further 4cm so the necklace can be worn longer if necessary. The silver plated clasp and extension chain are "Nickel Free" to comply with EU regulations.